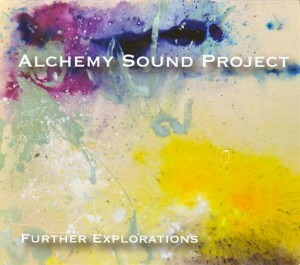 Further Explorations, a poignant new album by Alchemy Sound Project, is a mesmerizing combination of chamber jazz, symphonic music, modern jazz and big band. You might even hear strains of Charles Mingus in this aurally delicious mix. There are seven musicians-composers to thank for this imaginative, variegated music: trumpeter Samantha Boshnack, tenor saxophonist Erica Lindsay, reedist Salim Washington, trombonist Willem de Koch, pianist Sumi Tonooka, bassist David Arend, and drummer Max Wood. Nearly all play jazz regularly and have solid credentials, having worked with some of today’s best jazz artists. Additionally, Tonooka, Boshnack, Arend and Washington were brought together by the Jazz Composers Orchestra Institute, where they cultivated the skills necessary to test the boundaries of their jazz experiences. To that end, the reverberations of mainstream jazz take a back seat in this 10-song repertoire. There is only one uptempo piece, and extended improvised solos are kept to a minimum. Instead, most of the music is played at a slow, romantic pace. The sound of the full ensemble is beautiful and powerful. Instruments move in and out of the full group in surprising and interesting ways, the pieces suddenly changing colors and moods. And who doesn’t love the sound of seldom-heard instruments like the alto flute, bass clarinet and oboe? The air is full of lovely resonances that hold you spellbound on the opening “Charcoal, Clear, Beautiful All Over,” containing a tender Washington tenor solo. Lindsay’s title tune is bright and cheerful, and Boshnack’s “Alchemical” swings lightly in the jazz tradition. Listen in one sitting; you’ll love it all. Further Explorations: Charcoal, Clear, Beautiful All Over; Further Explorations; Alchemical; Waiting; Beta; Her Name Is Love; Archetype; Divergency; Joie De Vivre; The Call. Personnel: Erica Lindsay, tenor saxophone; Sumi Tonooka, piano; Salim Washington, tenor saxophone, oboe, flute, bass clarinet; David Arend, bass; Samantha Boshnack, trumpet; Willem de Koch, trombone; Max Wood, drums.